Each year as I complete a novel, I try to assess my current materials and update and make changes as necessary. 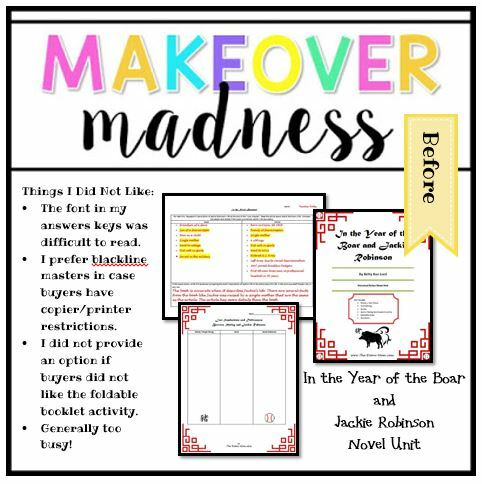 It works best if the updates happen as we work through the novel, but often I hang onto notes and student samples and won’t update until the book comes around again the next school year. 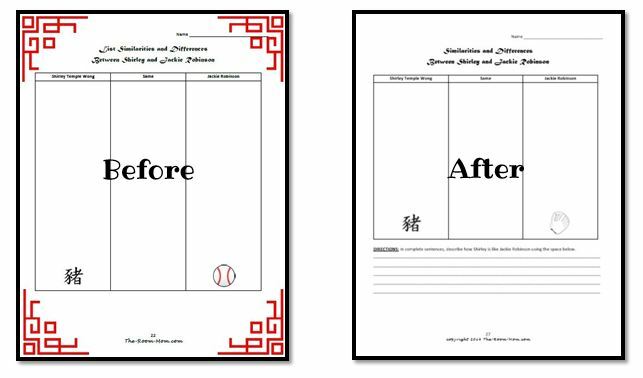 Prompted by the TpT Seller Challenge, I am ahead of the game and went ahead and updated our final novel unit of the school year, In the Year of the Boar and Jackie Robinson. When I am improving a novel unit, I use the student work and responses as my guide. If the students are not adding responses in the correct areas on a learning page or are not providing information that matches the directions on the page, I need to make some changes. I find that less clipart and borders will reduce the potential for confusion when completing an activity page (for my students), so I really keep graphic distractions to a minimum. I want a completed graphic organizer to reveal to students some big idea from the story. It will encourage students to draw conclusions about a character or theme that they might not recognize otherwise. If my students don’t get the “big picture” then the handout needs to be tweaked (or removed). I will use a fun font for headings, but I usually use Calibri, Tahoma, or other plain fonts for the bulk of the text on the page (directions, questions, content of any kind). If students ask me what something says on a handout because they can’t read the letters, I change the font. If I spend more time explaining directions than completing the actual assignment, I need to rewrite the directions. Sometimes, that might mean reducing directions– not just adding to them. I love it when student discussion sparks a new idea for a book activity. This year, I added a Chinese zodiac activity when the student began asking questions about their specific Chinese zodiac sign. I have considered this activity several times while reading In the Year of the Boar and Jackie Robinson, but I had other activities that took precedence. This year, we made room. We also added a webquest that involved hunting down information about patriotism based on a collaborative project with a local college’s education class. 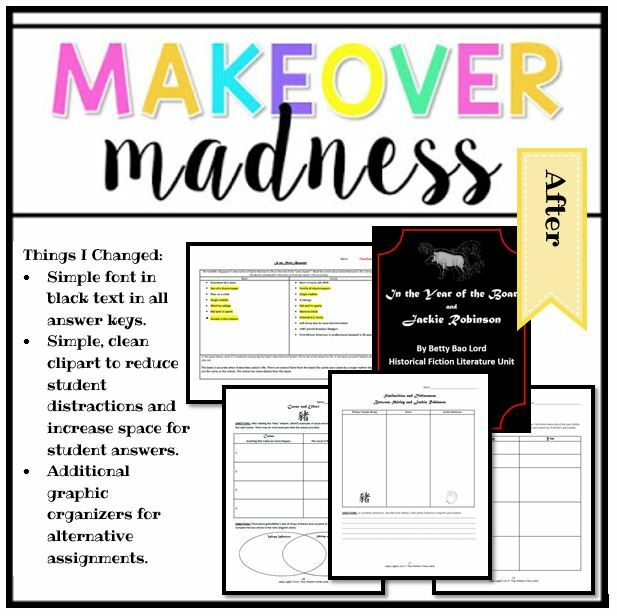 I always think of my classroom materials as works in progress and am constantly making changes. I am sure a year from now I will need an updated version of my In the Year of the Boar and Jackie Robinson unit! To see how it looks now and purchase at a discounted rate for the next 4 days, Click Here. To see more updated products by a wide variety of teacher sellers, visit Third In Hollywood, Sparkling in Second, Teach Create Motivate, and Peppy Zesty Teacherista. I agree. I can’t even believe I had those red corners in there!